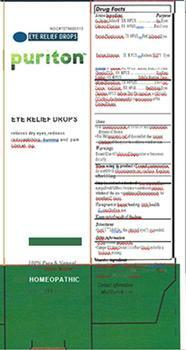 Kadesh, Inc., of Garden Grove, Calif., is recalling all lots of Puriton Eye Relief Drops. The product was manufactured without necessary production controls and conditions to assure sterility. The recalled product, an over-the-counter homeopathic eye drop for the temporary relief of burning and irritation due to dryness of the eye packaged in a 15-ml plastic bottle, NDC 7079600115, UPC 7 36972 1679 0, was sold nationwide through the company’s online stores and retail distributors. Kadesh is notifying its customers by recall letter and arranging for the return of all recall products. Customers who purchased the recalled product should stop using it. Consumers with questions may contact the recall department at by email at contact@puriton.us Monday through Friday, from 9 am – 6 pm (Pacific Time). The recalled product may be returned to Kadesh Inc., 4731 Lincoln Way, Garden Grove, CA 92841.